Legend has it that the name of this marvellous tea (White Cockscomb) was given by a monk in memorial of a courageous rooster that sacrificed his life while protecting his baby from an eagle. Touched by the display of courage and love, the monk buried the rooster and from that spot, the Bai Ji Guan tea bush grew. Today, Bai Ji Guan tea bush is one of the five famous Wu Yi's tea bushes. Among all the Wu Yi teas, Bai Ji Guan is the rarest. This is because it requires great skill and effort to produce this magnificent tea and there are not many tea masters that can do it properly today, to begin with. One error and the tea leaves could turn dark-brown like other Wu Yi teas. And from these handfuls of skilled tea masters, only a few of them are willing to process Bai Ji Guan tea. 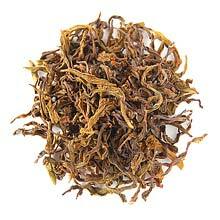 Its wonderful complex taste and rarity makes it one of the most treasured Oolong in the world. Bai Ji Guan taste is wonderfully complex. It starts off sweet, uniquely fruity with a toasty floral honeyed aroma and finishes with a lingering mellow fruit and honey note. The shape of the tea leaves are of ordinary Wuyi Oolong but the color is somewhat yellowish green.